The top of the Kizimen volcano is covered by ashes, lava and various volcanic emissions. The satellite of NASA Earth Observing-1 (EO-1) allowed to register eruption consequences, having made this picture on March 12. It is possible to notice that the smoke column still rises from top while snow covers a lava stream on East side of a volcano. Kizimen is a start volcano, which height makes 2376 m. The form of volcano reminds the Japanese mountain of Fuji before its eruption in 1980. The main crater of a volcano is expressed poorly. Kizimen’s slopes are covered with different volcanic outbursts. The scientists think, that in process of formation the volcano passed three stages. The first stage – allocation of the andesitic breeds, the second and third stages included lava outpourings, and then there was a formation of a basalt cover. It is known that there are hot spots in vicinities of a volcano. The volcano was formed about 12 000 years ago and belongs to Kizimen-Gamchensky group of volcanoes. There are 29 active volcanoes on the peninsula of Kamchatka. 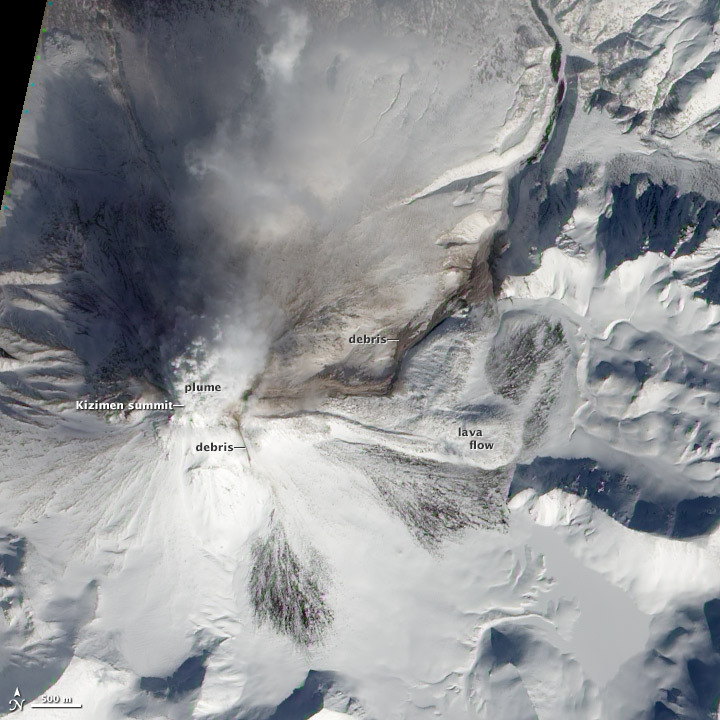 The volcanic eruption of Kizimen was observed in February, 2011. After two years in January 2013 pyroclastic streams (the mix of high-temperature volcanic gases, stones and ashes which are formed at eruption) flew down on volcano’s slopes. The Earth Observing-1 satellite is part of the program of NASA “New millennium”. The main idea is replacement of the device Landsat-7 which works at an orbit since 1999.